Engineering can be a challenging field to pursue, and that’s perhaps especially true when hardware requirements come into play. In fact, finding the best engineering laptops for students is an essential step to ensuring their success in the field. Not only will students spend quite a bit of time on their laptops, but they’ll also rely on it to be powerful enough to run complex applications while still being portable enough to take to class, the library, or the lab. It might seem as though finding the best laptop for college engineering students in 2018 should be an easy task. After all, there are hundreds of different laptop models on the market just waiting to be picked! The truth, however, is that engineering students, in particular, require a specific mix of features in their computers. And making a mistake when choosing an engineering laptop could be a critical error, especially given the relatively high price tags that are associated with some of the models. That’s where these reviews come in! The goal here is to cover some of the most dependable options on the market, whether you’re looking for the best laptop for civil engineering students or the best laptop for computer engineering students (and everything in between). 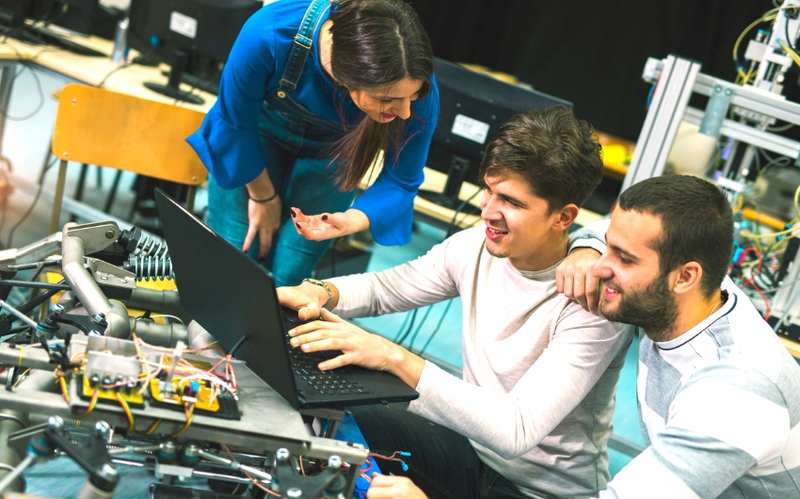 Take a look below at five of the best computing solutions on the market for engineering students and why you should consider them. When it comes to providing powerful hardware in an attractive package, the Dell Inspiron 15 Gaming laptop is definitely a hard option to beat. The laptop offers a six-core, eighth generation Intel Core i7-8750H Processor with a 9MB cache that boasts as much as 3.92GHz with Turbo Boost. That’s an impressive amount of power in a relatively small casing, with the laptop itself weighing only about six pounds and boasting a sleek 25mm build. This is not your typical bulky gaming rig! In addition to the above, Dell’s Inspiron 15 gaming option also comes standard with 16GB of DDR4 memory (2666MHz) and can be expanded to fit a maximum of 32GB in case you find you need an extra boost. It’s 15.6” LED display offers full, rich hues while its graphics processor, an NVIDIA GeForce GTX 1050 Ti card with 4GB of dedicated GDDR5 video RAM, ensures that even graphics-intensive applications run smoothly. It also comes with both an SSD (128 GB) and a SATA (1 TB) hard drive that offers plenty of storage for your assignments and applications alike. Another strong contender for the best laptop for engineering students is the Acer Predator Helios 300 Gaming Laptop. The laptop comes with the latest seventh generation Intel Core i7-7700HQ Processor with 2.8GHz of power that can be upped to 3.8GHz with Turbo Boost Technology. That’s four cores of power and a 6MB cache to keep your software running smoothly. If you’re comparing the Acer Predator with the Dell Inspiron model discussed above, you might wonder why this option is listed given that its processor is a bit slower and a bit older than the Dell model. There are a few reasons the Acer Predator is on this list. First of all, its graphics processor, the NVIDIA GeForce GTX 1060 offering 6 GB of dedicated GDDR5 video RAM, is superior to Dell’s GTX 1050 Ti option. The Acer Predator also offers a larger SSD (256 GB) although it does not come with an additional SATA drive. There is an extra 2.5” hard drive slot available for your own drive of choice, however, which does give you the option of choosing the size and speed that works best for your needs. Both models give the same 1920x1080 resolution. Finally, the laptop comes with 16GB of DDR4 memory and a 15.6” IPS display. The machine also offers an eye-catching metal chassis and is VR ready so you can jump into gaming in your spare time. The ASUS VivoBook is another solid choice for engineering students. Its eight generation Intel Core i7-8550U Processor might initially seem a bit weak at only 1.8GHz. However it can reach up to 4.0GHz and has an 8MB cache. It also boasts a particularly light and thin chassis, weighing only about four pounds, and its lithium polymer battery has an impressive charging time, taking only 49 minutes to reach 60% capacity. The graphics processor on the ASUS VivoBook K570 is a fairly standard NVIDIA GeForce GTX 1050 with 4GB of dedicated video RAM. It’s not the most powerful card, but it’s also not the worst. The laptop comes with plenty of storage, offering both an SSD (256GB) and an HDD (1 TB). It also provides some cool “extras”, like a fingerprint reader to keep your data safe. It’s 15.6” FHD display is an IPS-level display and offers intense saturation and clarity, making it an excellent option for both schoolwork and gaming. While this is not a budget laptop by any means, it is probably the most “premium” entry on this list. It comes with the familiar eight generation Intel Core i7-8550U processor also found in the ASUS VivoBook and offers the same speeds – 1GHz idle and up to 4.0GHz with Turbo Boost. It also offers 16GB of DDR3 SDRAM and four cores along with an 8MB cache to keep your workflow running smoothly. Its graphics processor, the GeForce MX150 with 4GB of GDDR5 video memory, is less impressive than the other options on the list and might be better used for less-intensive engineering operations. The Razer Blade Stealth really shines when it comes to its build. Its chassis, for example, comes from aircraft-grade aluminum and gives the laptop an exceptionally sleek form. It’s also the lightest laptop on this list, coming in at just under three pounds. Its display is also by far the most impressive, with a QHD+ 13.3” touchscreen display and a 3200x1800 resolution. The laptop is also integrated with Razer’s Chroma software, offering an impressive level of control over the laptop’s backlit keyboard. It might not be the most practical engineering laptop, but it’s one of the most visually impressive. With a good combination of quality features and budget-friendly options, the ASUS TUF Thin & Light Gaming Laptop is one of the more affordable options on the market; however that price does come with a few concessions. It offers an eight generation Intel Core i5-8300H Processor with 2.3GHz of power, for example, that doesn’t quite meet the i7 option. It still reaches up to 3.92GHz with Turbo Boost, however, and won’t necessarily struggle to reach speeds fast enough to suit your needs with its four cores and 8MG cache. All in all, this laptop offers a decent amount of power in a thin, portable package weighing only about five pounds. Unsurprisingly, the graphics processor in the ASUS TUF Thin & Light Gaming Laptop is not quite as impressive as our previous options. It comes with an NVIDIA GeForce GTX 1050 with only 2 GB video RAM. It also comes with a hybrid SSHD hard drive (1 TB), which is faster than a typical drive but not quite as fast as a dedicated SSD. Its 15.6” screen offers 1920x1080 resolution, the same resolution as the other laptops on the list, but it only comes with 8GB DDR4 memory (2666MHz), although this can be expanded to 32GB if you decide to do so yourself. This particular ASUS laptop has a desirable price and decent specifications. Is it the best laptop for mechanical engineering students or best laptop for biomedical engineering students? It might not be the ideal option, but it is a serviceable one that should see most students through their classes just fine. Wondering how to pick the best laptop for your needs? Let’s take a look at some of the most important factors to keep in mind when making your decision. The CPU is probably where you want to pay the most attention when looking for a laptop. Even laptops with excellent graphics processors and RAM will fall flat if the CPU is too slow. You want to look for a CPU processor that is at least an i5 or above. All of the options in the reviews above meet this requirement and should be more than fast enough to ensure that your computer runs quickly and doesn’t take too long to load things like AutoCAD or Matlab. After ensuring that your pick has adequate CPU speed, you want to turn your attention to RAM. The amount of RAM in a machine has a direct and significant impact upon its performance, so it’s better to invest in laptops that have at least 8GB of RAM available. Anything beyond that is great, but not necessarily vital. You’ll want to look at the graphics processor before you consider increasing RAM beyond 8GB, in other words. The graphics card in a laptop influences how well the machine can interact with demanding rendering and drawing software as well as how long working with these applications takes. Do not opt for a laptop that has an integrated graphics card – you want a dedicated card with plenty of dedicated VRAM (at least 2GB, but more is better). Finally, you want to pick a laptop that has plenty of space available. The best laptop for college engineering students will have quick-to-boot options like SSDs, but a laptop that has stellar specs in other areas but lacks an SSD option can still be a great pick. It’s all about finding a balance between the features discussed above. Now that you’ve seen some of the options on the market and understand a bit more about what factors to keep in mind when shopping, you still have to decide what you think is the best laptop for engineering students. From the laptops reviewed in this article, the best overall option is likely the Dell Inspiron 15 Gaming Laptop. It offers engineering students a powerful CPU and GPU, not to mention plenty of storage and RAM. It’s the perfect balance between quality features and price and would make a solid option for almost any student.